Cats will love this Honeysuckle Cushion toy. Some cats don’t respond to catnip, but most of those cats do respond to honeysuckle. This cushion is perfect for hugging, kicking, biting, batting around, and using as a pillow when playtime is over. Price is for one cushion. Comes in a variety of designs; please allow us to choose one for you! 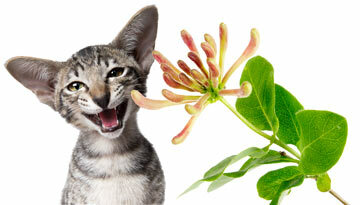 Not all cats respond to honeysuckle, but many cats absolutely love it. Made in the USA. I have some friends that don’t seem to care for catnip. I’ve always felt kind of bad that they didn’t join in when the rest of us got our crazy on with a catnip party. Luckily, my human knows a thing or two about cats and got us some of these honeysuckle pillows. Turns out that cats that don’t respond to catnip often react in a similar manner to honeysuckle. Now all of my buddies can join in the craziness! My cat wasn't excited by the honeysuckle at all. She did enjoy batting the cushion around, so that was nice. It isn't PurrfectPost's fault my cat seems immune to all cat-plants. We are the most handsome brother & sister Siamese twincats you'll ever meet. Hence our tastes are super unique, but these cushions have us enchanted!